It's no longer all Bordeaux, Burgundy, and Beaujolais in Paris. If you fancy a cocktail—shaken or stirred—there's finally a number of standout bars mixing up fantastic concoctions, be them rum-focused or absinthe-infused, garnished with basil, candied ginger, or a frozen grape on top. Of course, some of the best are often hard to find—disguised, even. When Candelaria debuted behind the guise of a tiny, narrow taqueria in the Marais in 2011, it was one of the first of its kind in the city. Today, a handful of like-minded spaces have followed suit, causing curious cocktail-lovers to wander aimlessly outside addresses wondering where to find them. With the second annual Paris Cocktail Week running from until January 30th, featuring more than 50 bars and restaurants pouring specialty drinks for specialty prices, here's a look at a few newer hot spots that aren't exactly as they appear. 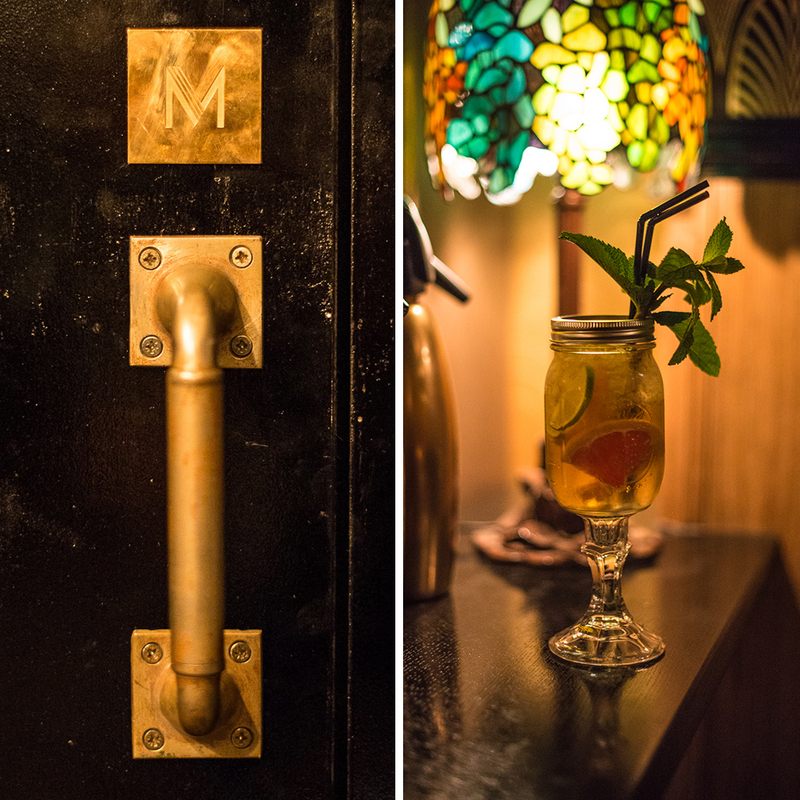 This rum-loving bar in the second arrondissement uses grilled cheese sandwiches as its cover. You can't miss it from the street, with its yellow sign and bright fluorescent bulbs lighting up what appears to be a casual spot for melty, gooey grilled sandwiches. But continue on back (where, don't worry, you can also order a tuna melt for $7) and you'll find yourself in a dark cocktail den, complete with tufted velvet arm chairs, wooden bar stools with leather seats, and French rap on the sound system. At this popular bobo spot, waiters in jeans with suspenders are on hand to serve cleverly named $14 drinks like "Tempted to Touch"—boasting an unusual rum infused with Stilton cheese and a "banana colada emulsion"—many of which come with delicious garnishes, such as a bite of sugary licorice with cardamon. From the outside, this bar that debuted in August is called Elaichi, which appears to be a hippie chic café serving Darjeeling tea, lassies, and naan chips. But once you venture past a heavy, camouflaged door, then a corridor with jungle-themed walls, you're transported to India—or, at least, on your way. Designed to look like a vintage train with booths and flatscreens that show passing countryside, this spot is all kitsch. Waitresses wear bindis on their foreheads and the music is Bollywood-inspired. The "Krima Brulée" cocktail is not as sweet as it sounds, but its froth does get caramelized with a torch like the famous dessert, and the spicy "Bloody Kali" is Mary's cousin concocted with coriander. There are also various snacks to munch on, including fresh-baked naan with goat cheese and honey, and skewers of chicken tikka. Should you need to do a load of laundry on a Saturday night, bring your whites and colors to this new spot near the Place de la République that opened in September. Behind a massive dryer on the ground floor of what appears to be a laundromat lies a dark, narrow staircase up to a bar that's as steamy as any spin cycle—so steamy, in fact, they've worked antique fans into their retro chic decor, alongside Brillo pad pouf stools and wooden swings that hang from the ceiling. The clever (if not a bit odd), drinks are reasonably priced (from $10) and include the "White Norway," made with smoked-salmon-infused vodka, as well as the refreshing "Basilic Instinct" that features cucumber juice, basil, and gin. Consider yourself forewarned: If you drink too many, they won't be responsible for folding your sheets and towels. This bar doesn't really try to hide, it just looks like an abandoned garage. Its facade is covered from the ground up in posters and graffiti, giving the allure of a forgotten, beaten-down motor shop. But step inside, beyond the bouncer—the only tip-off there may be something great beyond the grit—and it's all glitz, glam, and rock 'n' roll. Gold curtains separate two small rooms, and coins are stuck into the cork ceiling, which gives the appearance of a soundproofing system for the loud tunes, which range from Stevie Wonder to Kanye West. Servers bring cucumber water unannounced (a rarity in Paris), even before you order one of their $11 to $14 drinks. Try the appropriately named "Drop the Beet," made with the French apple brandy Calvados, beet juice, and house ginger. As any true tippler knows, the best post-imbibing nosh is pizza, which is why this bar in the trendy 11th arrondissement is a win-win. Up front, you've got what looks like an ordinary Parisian pizza joint with round cabaret tables outside, subway tiles inside, and red accents to match its tasty tomato sauce. Called Pizzeria Da Vito, it serves antipasti, personal pies ($10 to $16) and "dolce" that includes a choice of pizza with Nutella or a house tiramisu for $8. But bypass the brick oven—managing, if you can, to ignore the inviting scent—through the wooden doors of a cold meat locker and you're suddenly in Moonshiner, a straight-from-the-1920s Prohibition Era joint. With etched-glass wall sconces, exposed brick walls, and art deco black and gold wallpaper, you'll be shimmying along to the jazzy tunes with every sip of your $13 "Scarlett O'Clara" cocktail, made with honey vodka, blackberry liqueur, and topped with Champagne. A large section of the menu is dedicated to whiskey cocktails, and tasting flights are available, too, which, should you choose to enjoy with a smoke, can be done in the designated room that surprisingly smells more like burning cedar than tobacco. It doesn't hurt that the lingering scent of pie crust rolls in every now and again, too.